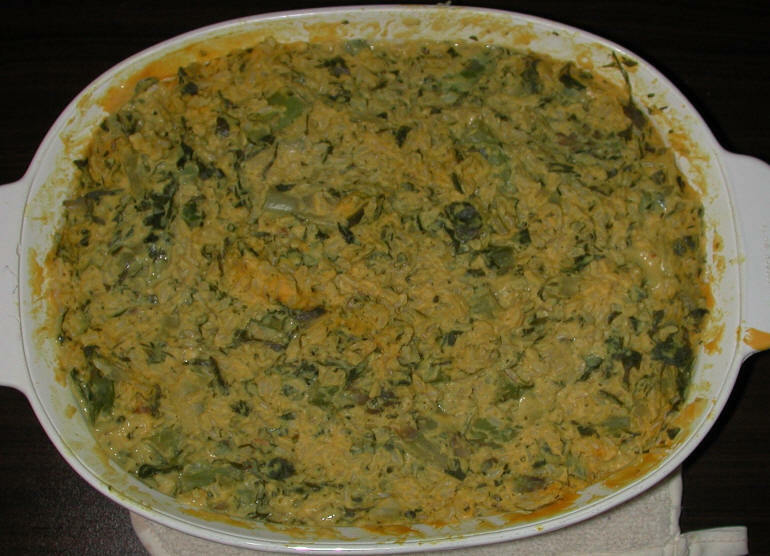 Asparagus collards rice casserole with tofu cream sauce is a delicious vegan recipe that will delight the whole family or those gathered at a covered dish supper, and it doesn’t lose its flavor as a great leftover. Preparation and cooking times overlap and take about 1 hour. Peel and dice the Onion and peel and mince the Garlic and place in a large covered glass baking dish and precook for about 5 minutes in a microwave oven on “high”, or in a conventional oven at 350 degrees F.
Thoroughly wash the collard greens and coarsely shred in a food processor or by cutting with a knife. Add the shredded collard greens, oregano, and cayenne pepper to the onions in the baking dish and cook for about 10 minutes or until the collard greens become tender. Mix every 5 minutes to insure even cooking. While the collards are cooking, wash the asparagus spears, trim off the bottom 1/4 inch and cut into 1 to 1-1/2 inch lengths. Add the asparagus to the baking dish and continue cooking for another 10 minutes, mixing every five minutes. Place the tofu, lemon juice, peeled and cut carrots, turmeric, nutritional yeast, and corn starch in a high speed blender. Cover and blend on “high speed” until creamy smooth. When the asparagus and collards are tender, add the cooked rice and the blenderized tofu ingredients and mix thoroughly. Cover and place back into the microwave or conventional oven and cook for another 5 minutes. Mix again and cook for another 5 minutes or until the casserole has thickened and somewhat firmed on top.